Jenya and penguins waiting for you! Today and tomorrow! We'll be delivering up stuffed penguins, nooks, posters and photos. Stop by and say "Hi!" The Salem Holiday Market is located at the Oregon State Fairgrounds. We're in the Columbia Building right next to the doors! Come find us! The Salem Holiday Market is scheduled for December 7 - 9. One of the market vendors this year is Might Fly. Carrie and Ben answered some questions about their participation in the market and what people can expect from the experience. How many years have you been attending the Salem Holiday Market? Might Fly has been going to the Holiday Market for 5 years. What are you bringing to 2018’s Market? Might Fly sells prints of Carrie's original whimsical artwork. What’s new at your booth? There are always new pieces of art to be found at Might Fly. This year we added adorable dinosaurs, a baby elephant chasing birds, and some new graphite drawings. What’s your favorite thing about Salem Holiday Market? We really love how beautiful and warm the whole atmosphere of the market is. What’s the best advice you have for people coming to the Salem Holiday Market? Use the market map and plan your way around the whole market or else you'll miss so many treasures. Might Fly’s art is about reminding people that “life is beautiful.” You can find Might Fly in the Jack Longman building at booth J-C11. Join us at the penguinate.com table in the Columbia Hall at booth C41. We’ll have penguins, books and prints! See you at the Salem Holiday Market! Laurie Linn of Laurie Linn Designs will be attending the 2018 Salem Holiday Market as a vendor. She took some time to answer our questions about her participation in the event. Laurie Linn Designs will be at booth C-E6 in the Columbia Hall. Penguinate.com will be at the Salem Holiday Market, too! Come find us for stuffed penguins and books! We’re at booth C41. Debbie Clevenger of Uniquely Done by Debbie will be at the Salem Holiday Market. She took time to answer our questions. Visit her at table C-E7. How many years have you been attending the Salem Holiday Market? This will be my 3rd year that I will be a vendor at the Salem Holiday Market. What are you bringing to 2018’s Market? I am bringing my fleece animal hats, infinity scarves, ear covers, aprons, 18-inch clothes, doll head bands, doll animal hats, two different sizes of cloth-stuffed dolls. What’s new at your booth? I decided to make these really cute stuffed clothes dolls, each one has a different outfit and different hairstyle. There are two different sizes. And there are boy and girl dolls. What’s your favorite thing about Salem Holiday Market? My favorite thing about the holiday market is the variety of the items that are there for sale and how talented all of the vendors are, and everyone is so nice. What’s the best advice you have for people coming to the Salem Holiday Market? My best advice to anyone coming to the market is to bring plenty of money and give yourself lots of time to look at everything there, and don't forget to go through the second building, too. I've been doing the market for about 8 years. I'm a glass artist working primarily in stained and fused pieces. I design unique and current art glass, and often functional. For this year, I'm going to be in mosaic/stained glass mode for wall art. We'll see what comes. The market has been a fun place to be all the balloon characters and last year, a gingerbread balloon house for Santa. If I were attending the market, I would love the free parking and the lighter crowds since there are two buildings now. Bedard has 22 years of experience as an art glass fabricator and designer. Check out the LB Glassworks Facebook page for examples of her work. LB Glassworks will be at booth spaces C3 and C4 in the Columbia Hall. The Salem Holiday Market is at the Oregon State Fairgrounds. Penguinate.com will also be at the Salem Holiday Market, in the same building as LB Glassworks. We’ll have penguins, books and posters. We look forward to seeing you at the market! 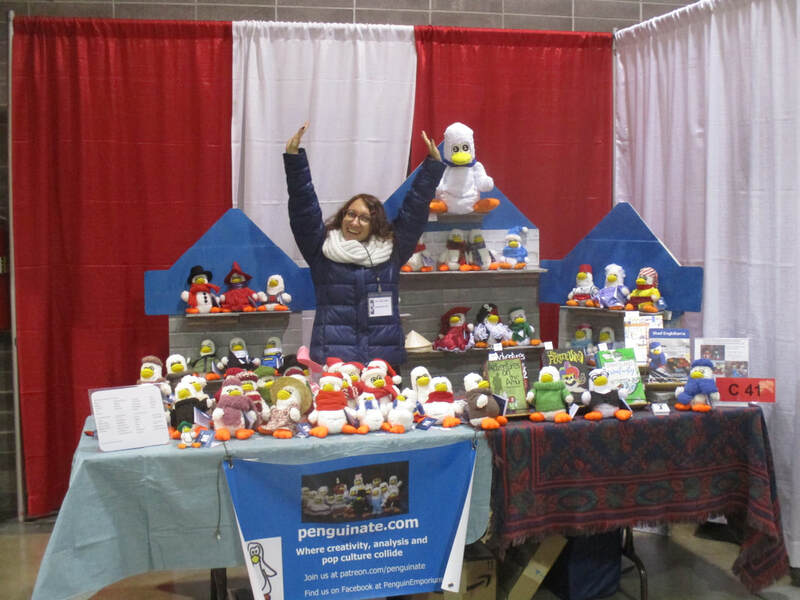 If you want to take advantage of discounts for Patron Penguinators at our table at Salem Holiday Market 2018, Today’s the last day you can join our Patreon. It doesn’t matter what level you pledge, you’ll get $1 off for every $10 you spend at our table. That’s in addition to any other deals we may be running. That means on Friday evening if you spend $45, you’ll get the $5 off because of the early bird special at Salem Holiday Market and an additional $4 off because you joined our Patreon. Your $45 purchase becomes $36! Plus, as a Patron Penguinator, you get access to all kinds of cool things, like behind the scenes sewing photos, early access to articles and notices about upcoming books. Even if you aren’t the joining type, you should be aware of the coupon available for your use. It won’t cost you a thing. Just download it and bring it with you to the Salem Holiday Market to get a discount on your admission! It’s absolutely, unequivocally free, and like Pinocchio, it’s got no strings! Seriously, just download it, print it out and bring it with you. Friday evening at Salem Holiday Market is a benefit for Chemeketa Education Foundation’s Student Relief Fund. Many vendors will have amazing deals ($5 off your purchase of $45 or more at our table, for example), and there will be wine and hors d’oeuvres. Salem Holiday Market is scheduled for Dec. 7 from 5:30 to 8:30pm, Dec. 8 from 10 to 6, and Dec. 9 from 10 to 4 at the Oregon State Fairgrounds. We're in the Columbia Building at table C41. We hope to see you during one or more days! Come get penguins, books and posters! Check out our preview here. 'Penguinate! Creativity for a Better Life and World' Available now! “Penguinate! Essays and Short Stories: Improve Your Creativity for a Better Life and World” released on November 15, 2018. I couldn’t be more excited. But wait! “What does ‘penguinate’ mean?” you ask. It’s really quite simple. Penguinate: a verb that means to use creativity in constructive matters to make life and the world better for you and others. Penguinators are the people who practice such creativity and support www.penguinate.com through book purchases, site visits and Patreon. Not all creativity is constructive. People who rob banks or steal identities on the Internet are creatives using their power to perpetrate acts of evil. Oil company researchers are creative whether what they do is good or bad depends on where you stand on the arguments against fossil fuels. Cigarette advertisers are creative. Their efforts do not make the world a better place or encourage a healthy lifestyle. At penguinate.com, we believe that creativity in a positive form is the key to living a healthier life and self-actualization. Through creativity, people have more fun and achieve greater self-esteem as the realize the power that they have. When you become empowered to bring to the world your creative endeavors, you become the best version of yourself and help others to achieve the same thing. Next month, we’re going to be at the Salem Holiday Market, and you should be, too. Friday Night from 5:30 to 8:30pm is a special night benefiting the Chemeketa Education Foundation Student Relief Fund. Entry for one person is $8 and $15 for a couple. Wine tasting and light hors d’oeuvres will be served. And you can use our customer appreciation coupon! There will be early shopping deals available, too, at the penguinate.com table C41 in the Columbia Hall. 10 percent off every purchase for everyone; applied after your Penguinator Patreon discount for our Patreon members. On Saturday, the Salem Holiday Market is open from 10am to 6pm. On Sunday, it runs from 10am to 4pm. Admission is $4, but children under 12 get in free. Both days, you can receive discounts by using the coupon, bringing a can of food with you to support the Chemeketa Food Pantry to get $1 off admission, or bringing a second person and his or her admission is half price! On Saturday, if you buy a 2-day ticket, you get half off Sunday’s admission. On Sunday, people over 62, military and first responders get $2 off admission. Only one discount per person per day. That’s a holiday full of deals, and parking is free! Come down to the Salem Holiday Market and check out our penguins and books. Remember, as a Market guest, you’re eligible to win door prizes! Penguinate Website and Book news! Penguinate.com has a new home! In case you missed it, penguinate.com is getting migrated. I have moved to a Wordpress website that can be seen all over the world. That means that a lot of pages are not accessible on the penguinate website. I will migrate many of them over, but it looks to be a process that could take months or longer. If you’re looking for something from the old site, it can still be viewed, for some countries, at www.penguinate.weebly.com. I have a new book available for preorder! “Penguinate! Essays and Short Stories: Improve Your Creativity for a Better Life and a Better World” is now available at Amazon.com for preorder as an eBook and on my own website for preorder as a paperback. It will be released just in time for the holidays on Nov. 15, 2019. Scheduled for release at Lilac City Comicon 2019, “The Haunted Mansion Is Creativity” will take you on a tour of the mansion and using its history and structure guide you through creativity principles. Disneyland’s Haunted Mansion celebrates its 50th anniversary in 2019. I have asked several prominent members of the Disney and entertainment community to give me their take on the Haunted Mansion. A story long in the creating, I found an artist to do “There Are No Penguins in Alaska.” Featuring my favorite penguin in “Where’s Waldo” type of adventure, Antonisa Scott and Transcend Studio have agreed to create what promises to be an amazing coloring book with a seek and find aesthetic. No release date has been set. A compilation of thoughts inspired by movies from 2017 and before. Penguinate! At the Movies is more than just a set of movie reviews. It is a book that thinks deeply about what’s been seen on the silver screen. No release date set. Another compilation of essays about the Disney Company including the movie business, the parks and Walt Disney. Take a walk down memory lane and explore both the light and dark sides of the Disney Company. Not endorsed by the Disney Company, this compilation will include a look at Disney films from Snow White and the Seven Dwarfs to Frozen while also exploring the creative aspects of the business. Disneyland and its sister parks will not be overlooked. No release date set. As an author I am excited about putting these ideas out there. If you have a favorite, let me know. If you buy eBooks, remember to preorder “Penguinate! Essays and Short Stories” for creativity! I’ll be at the Salem Holiday Market 2018 on Nov. 7 to 9 to sell and autograph books, and Jenya will be bringing her penguins! Be sure to preorder and then come by and say, “Hi!” Get a discount with a coupon from our website, and join our Patreon for further discounts. Accepted! They Like Me, or at least my story. I got accepted for publication! The 12th Drabble Contest accepted my “drabble” called “Rhapsody in Blue.” A drabble is a 100-word story - no more, no less. The contest was themed as “Space Western.” Of course, there will be more Drabble contests in the future. They haven’t announced the theme for the next one, but it will be in their newsletter along with the names of the current Drabble winners! Alban Lake Publishing is based in Iowa and publishes periodicals, novels and novellas. Check out their website! They are also available on Amazon or at their own online store. Anyway, after 32 official rejections, at least one of my stories will be showing up in print! Of course, I still have my books available and a ton of stories on my own websites. I am also continuing the submission process for other stories. I expect many more rejections and, sooner or later, many more acceptance notices! For the moment, I’m going to savor my drabble win. Thanks!